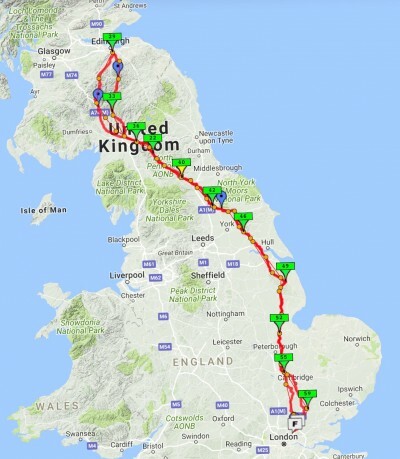 Weird to think that a year ago I was engaged in the most epic bicycle ride of my life: London Edinburgh London. My soundtrack to that ride was Amy McDonald, with this song. It was largely in my head, but occasionally belted out on a long empty road when I needed to pick my spirits up. There is something adventurous and exciting in this song that brought it to mind while I was on this most adventurous of rides. The best part of having a soundtrack in your head is that you can mash it up with other songs. Strangely, I mashed up the chorus of This is the Life with the chorus of the Cranberries song Zombie. It somehow worked. So what are my long term reflections on London-Edinburgh-London? I remember in the immediate aftermath of the ride, discussing with friends that I had no desire to do it again. I remember saying that it was a brilliant ride that was spoiled by the time-limit which added constant pressure to keep pushing on, night and day. There were large sections of the ride where the natural beauty of the country couldn’t be appreciated because we were riding through it at night. And there was the physical pain obviously in various parts of the body. Even then, I had a notion in the back of my mind that I could change my mind. A year later, only the romantic memories have stuck: I know the ride had ups and downs but I am 100% certain I will do the ride again, if possible. I love Gideon Conn, and have seen him perform live a few times. With recent news of wildfires raging across Europe as well as in California this song came to mind. Gideon is often a very ‘literal’ artist: the songs often appear to be exactly as described on the tin. Witness for example: The Man Who Drives Around Selling Fish, and Pylons and Wires. On the other hand, Wildfire is not so literal. Released in 2007 (at the time of the global financial economic crash), it examines the role of money and debt and it’s impact on society and individuals. The video above provides a ‘nostalgic’ look-back at a middle-class family in a family crisis (presumably financial), with Conn as some kind of observer and participant. One wonders what the relationship is between him and the family. I’m not sure whether nostalgic is the correct word here, due to the unease that Conn generates in the song and that is captured so well in the video. Gideon Conn’s art and music is available on his website, and you can follow him on Facebook.